Is “Utopia in Four Movements” sparking a movement itself? The celebrated “live documentary,” which screened at the 53rd San Francisco International Film Festival last month, has audiences, filmmakers and industry professionals excited, wondering if live docs will be The Next Big Thing in indie cinema. A Live Doc Sam Green narrates “Utopia: In Four Movements,” while The Quavers perform. Directed by local boys Sam Green (Oscar-nominated “The Weather Underground,” 2002) and Dave Cerf (that film’s composer), it illuminates various utopian impulses of the 20th century. Told in four “movements,” “Utopia” delights in the idealism of wanting a better world while revealing the tragedies that can result from big dreams. First, comes an exploration of Esperanto, the invented language meant to unify a fractured world. The second movement, “Revolution,” takes on the allure of socialism, its problematic aftermath, and suggests Cuba as the home of its dying embers. Third is “The World’s Largest Shopping Mall”– an eerily empty consumer wonderland in Dongguan, China – a metaphor for capitalist hopes and failures. The fourth part is a meditation on forensic anthropologists, who pick up the pieces of genocide – utopia’s greatest catastrophe. By identifying the names of bodies in mass graves, they restore dignity to those lost. The four movements are lyrically constructed, anchored by sculptural cinematography and told with beauty and breathing room. In case you didn’t catch this fact, the film is performed “live.” Green narrates while cueing images from a Keynote remote onstage. 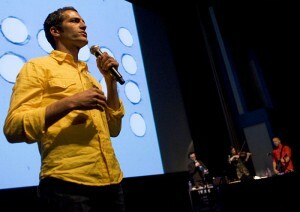 The score is performed by the Brooklyn-based band, The Quavers, and mixed on the spot by sound-artist/co-director Cerf. It’s “a movie being born as you see it and hear it,” writes author Rebecca Solnit, in the film’s program. “It’s as alive as music.” Green messes up periodically – nothing disastrous – but this, along with occasional spontaneous audience participation, means that no two performances can be the same. But what is new about this? Although there is no defined genealogy from which it originates, live elements in films are as old as cinema itself. In 1895, the Lumiere brothers held the first-ever motion picture screening in a Paris basement featuring a piano accompanist. Organs, and later whole orchestras, were commonplace through the 1920s, as were character actors speaking aloud behind screen. Japanese benshi films that endured through the ‘30s more closely approximates Green’s performance; they relied upon an in-person narrator to guide the audience through the silent images onscreen. Decades later, Warhol’s “Exploding Plastic Inevitable” (EPI), then dubbed “intermedia art,” is another example. Between 1966 and 1967, Warhol staged series of live performance events in auditoriums around the country. They featured The Velvet Underground and Nico rocking in the flesh, the simultaneous projection of multiple (often pornographic) films, disco balls sparkling, spotlights flashing, and pop records blaring, all to barrage the senses. Art critic Wayne McGuire interpreted “Exploding Plastic Inevitable” as a clarion call to reinsert humanity into “increasingly uncontrollable and proliferating technology ” to stave off the total mechanization of social interactions. Green and Cerf’s “Utopia,” though, is more documentary than concert, more visual poem than multimedia frenzy. Green sees a place for his kind of live documentary in the future of cinema. He explains his reasoning in terms of music: “Independent film distribution is always a couple of years behind the music industry. When people over the past decade began downloading music, this changed the game. Now, musicians mainly make money through touring,” Green said. “Utopia” producer, Carrie Lozano, is not sure if live docs will catch on, largely due to the hefty financials they require. A tremendous amount of production went into “Utopia,” a fact often overshadowed by the film’s live elements. “People forget that we shot everything,” Lozano clarified. “We shot on film in Cuba, on HD video in China – we went all around the world.” You add the costs of an international production to the technical complexity of the live presentation and you have a serious budget on your hands – one that should not be entered into lightly. Right now, touring the film presents a challenge, but Lozano is optimistic: “Given the right combination of filmmaking and music, and the right venues, live docs like ours could be more commonplace.” She reminded me, though, that her team is still in the early stages. “We’re still working all this out. Ask me in a year what I think!” she laughed. Uyehara does, however, encourage event-based programming. He has been instrumental in the curation of live Festival multimedia events, such as this year’s “20,000 Leagues Under the Sea” (1916) scored live by Magnetic Fields’ Stephin Merritt, and last year’s popular screening of “The Lost World” (1925), featuring music by Dengue Fever. “Right now, live films pose some programming challenges, but I hope we do see more work like Utopia – that is, if the content fits,” Uyehara added. Green and Lozano agree that, if live docs are to populate the media landscape, “live-ness,” should not be used as a gimmick. “Utopia’s” live form aptly fits its content and developed organically as the production progressed. Turning ‘live-ness’ into a fad undermines the unique experience live cinema is meant to foster. While inspired souls will surely follow in “Utopia’s” footsteps, a movement of live docs might prove more difficult than excited audiences predict. “Utopia” does, however, suggest a different kind of movement: away from the practice of solitary YouTubing, towards the collective event of theater. “Utopia” revives both the magic and the sociality of cinema. As Solnit says in her essay, “Utopia is sociable, and Green and Cerf’s ‘Utopia in Four Movements’ gives you back that sociability… by making it as live as a silent movie with an orchestra, a nineteenth-century Chautauqua lecture, a sermon or a party.” “Utopia” cannot be viewed alone on a television, a computer, an iPhone or iPad. The theater – with its audience community together in dark – is its singular home. “Utopia in Four Movements” finds its next Bay Area screening at the San Francisco Jewish Film Festival in July (date TBA) and will be screened at the Seattle International Film Festival and the Los Angeles Film Festival this month.